I’m in the process of updating our small laundry room/mudroom on a tight budget, and I had to figure out a way to make the ugly fluorescent light fixture look good with what we had instead of buying a newer, prettier fixture. My solution? 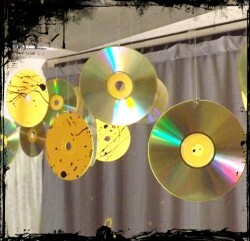 Paint and hang old CDs from the light cover! I’m happy with the results and sad that I can’t get a photo to do it justice. 1. 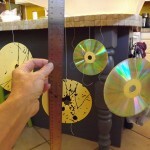 Lay 21 old CDs on a drop cloth–irridescent side down–and apply three coats of spray paint (allow the paint to dry fully between coats). 2. Drizzle a contrasting color over the painted CDs. 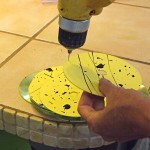 I used the lid of the can of paint to drizzle black paint over the yellow CDs. 3. 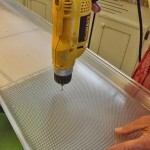 Drill 21 holes in the shop light cover at regular intervals. 4. Drill a hole in each of the CDs close to the edge. 5. 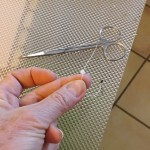 Cut 21 pieces of thread and tie a bead at the end of each piece. Poke the thread through the holes in the shop light cover. 6. Tie the other end of each thread to a CD at alternating lenghts. 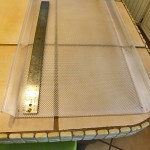 As you can see from the pictures, this is a super easy way to decorate a fluorescent shop light. You could also use this tutorial to make a kinetic ceiling art installation anywhere. Think… over the baby’s crib… Over grandma’s recliner… Get the idea? Stay tuned for a complete transformation of our laundry room including: a faux stainless steel counter, storage ideas, diy mirrored cabinets, and quick french windows.